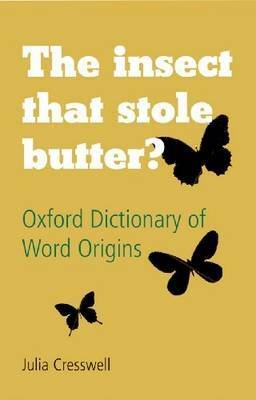 Julia Cresswell is the author of over a dozen books on words, language, and ideas, and her latest book is The Insect that Stole Butter? The Oxford Dictionary of Word Origins. In the original post below, she writes about the history of language as ‘a linguistic archaeology of the mind’, including the puzzling history of the word ‘sack’. From the age of five my ambition was to be an archaeologist. However, when it came to going to university, no university I applied to to study archaeology was willing to have me. But I did get a place to study English at Oxford (this sounds strange by modern standards, but this was back at the end of the 60s, when all the rules were different). At Oxford I was one of the handful to follow the course in early literatures and the history of language which was devised by Tolkien and Lewis to counteract the dreadful obsession with studying recent writers such as Dickens. While studying, I was able to discover a new sort of archaeology – a linguistic archaeology of the mind. The great joy of looking at word origins and development is the way that it opens doors to both the thoughts and culture of the past. Just as the early literature enables you to try to get an understanding of the minds of both the writers and the audiences of the past, so focusing in on the individual words or phrases can give a different sort of understanding. Sometimes we can see a fairly clear-cut story of developing ideas, such as in the word scarlet, which started out as a term for a fine quality cloth, and changed into a colour term because a good, strong, permanent red dye was expensive and thus associated with expensive cloth (although it is not always easy to tell in later Middle English and Early Modern English which sense is being used). More often, however, there are no clear-cut answers. Take for instance the word ‘sack’. Why on earth did the Germanic people borrow the word for a large bag from the Romans? There is no way that their culture could not have had some similar form of container, so what caused them to adopt a foreign term? If we gather together all the words that were borrowed from Latin before the Anglo-Saxons settled in England, can we construct some sort of a picture of their life that would show a possible reason based perhaps on trade or prestige goods? It is not too difficult to imagine a set of possible circumstances that would allow the transference of such terms between cultures with such a marked difference in material culture. But if we push the history of sack back further we find that not only was the word borrowed by most other languages, the Romans themselves borrowed the word from the Greeks and the Greeks borrowed it from one of the Semitic languages. This is a real puzzle to which I have no answers, although I find trying to envisage the possible circumstances behind it excellent exercise for the imagination. We don’t even have to go very far back in linguistic history to find opportunities for this sort of exercise. We only have to go back a generation or two to read material containing casual and unconscious racism, classism or sexism that would be unthinkable today. What must it have been like to live in a mind like that, to be so confident of superiority, yet at the some time so closed off from the ideas we have today? As you note, “trade or prestige goods” seems to underlie some of these transmissions, but there is so much we do NOT know about earlier cultures that one hesitates to speculate too much (the only way we even know that some early cultures existed at all is because they left behind a SINGLE piece of numismatic or other evidence)….